Governing the gravity charge for a sixth straight season, former UCI World Cup Champion Steve Smith is on a mission to repeat. And following two years of sidelining injuries, he’s spent the winter attacking tracks and getting back to race-winning form. Joining Smith in the hunt for DH dominance are Mark Wallace and rookie Norwegian Brage Vestavik. Wallace enters 2016 on the smoking wheels of a breakout season that included capturing 6th place at the Mont-Sainte-Anne World Cup and a massive 2nd place finish at Crankworx. Seventeen-year-old Vestavik, on the other hand, is a Hafjell Bike Park mainstay, who’s been crushing podiums in Norway since he was knee-high to a Viking’s battleaxe. Look for him to unleash that arsenal of potential across the JR World Cup calendar this year. Fellow Frenchman Theo Galy accompanies Oton on his Enduro World Series quest and at other special events around the globe. Finally, three young development riders will also race select events with DGR in 2016: Magnus Manson (gravity), Stu Dickson (enduro), and Luke Dimarzo (enduro/XC). The UCI World Cup season detonates in April, when the DH team travels to Lourdes, France. And in March, the Enduro World Series squad sets its sites on the first test of the season at Valdivia, Chile. 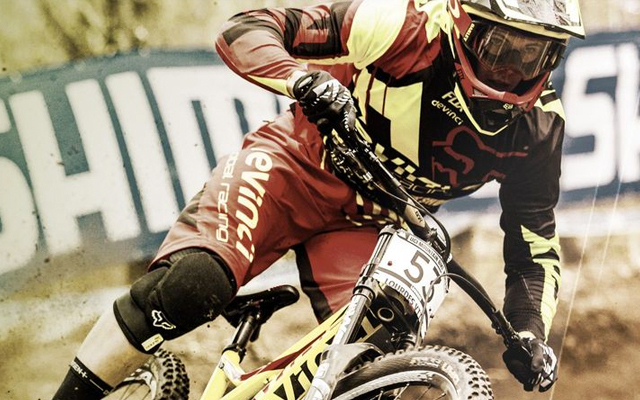 Reliable, cutting-edge equipment is crucial to race-day success and Devinci Global Racing’s handpicked partners are industry leaders in their respective categories, giving team riders the best chance to land on the podium. For 2016, DGR is proudly supported by Devinci Cycles, Sram, RockShox, Maxxis, Raceface, Fox Racing, ODI, SDG, E-13, Hit Case, Crankbrothers, Scratch Labs, Maxima, Biknd, FSA, Five Ten, 2Undr, and Projekt.